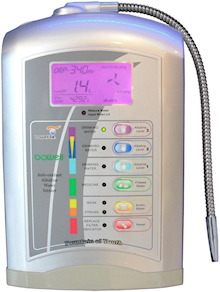 Alkaline Water Ionizer Machines with 60 Day 100% Money Back Guarantee. Now you can experience for yourself, risk free, what making the switch to electrolyzed reduced drinking water has to offer. 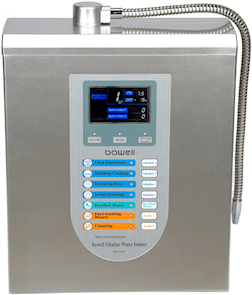 We invite you to read the scientific research on ionized alkaline water. Previous Bawell customer reviews and testimonials attest to what medical researchers have discovered. What is the PH of your favorite drink? Alkaline or acidic? Why switch to alkaline ionized drinking water? For starters, buying regular bottled water or specialty alkaline bottled water brands is very bad for your pocket book but more importantly the environment. There are 52 weeks in a year and if you spend $10 to 20$ per week on bottled water that equals $520 to $1040 each year before taxes. In addition bottled drinking water is loosely regulated in the United States, so many times it is of lower purity than tap water. Bawell alkaline water ionizer filter system benefits not only save you money in the long run, they work by using an electrolysis process which gives the water three distinct properties that are not found in tap or bottled water. First, a higher PH is incorporated into this water which helps the body neutralize acidic waste which we are constantly absorbing. This acidity is the result of simple metabolism or gained from other sources, like the food we eat and even toxins in the air we breathe. The more we consume highly acidic things, the harder we and our bodies need to work to maintain a balance, which means switching to a diet high in fruits, vegetables, certain types of fish, and drinking plenty of alkalized water. Second, reduced water has an abundance of negatively charged hydroxyl ions called ORP (Oxidation Reduction Potential) which actively seek out and neutralize cancer causing positively charged free radicals. Free radicals are a by product of cell metabolism which means they are constantly being produced inside your body. Free radicals are also obtained from your environment and the foods you eat. By consuming millions of these negatively charged hydroxyl ions in every glass of ionized drinking water, you can provide your body with a fresh source of antioxidants in every glass to neutralize harmful free radicals. These hydroxyl ions are potent antioxidants which detoxify your body naturally and are the reason why natural weight loss of fat in acidic persons occurs when you consume this water on a daily basis, you will even start to notice the changes in less than a few weeks! Third, water that is put through this process is micro-clustered into groups of 4 to 6 H2O molecules per cluster instead of the 12 to 16 molecules per cluster that you would normally find in ordinary water. These smaller clusters lead to faster rehydration because the bodies cells find it easier to absorb and make use of these smaller sized water clusters through their cellular walls. Additionally minerals in the water also become ionized making them easier for your body to absorb. Learn about the science utilized in this technology. Scientific research has shown alkaline ionized water health benefits to be associated with anti-oxidant properties that provide cancer-fighting protection against oxidative damage to the body. Other studies have suggested that these anti-oxidants can also improve the effects of ascorbic acid or Vitamin C, which can result in improvements to the immune system along with many other health improving benefits related to a myriad of health disorders. 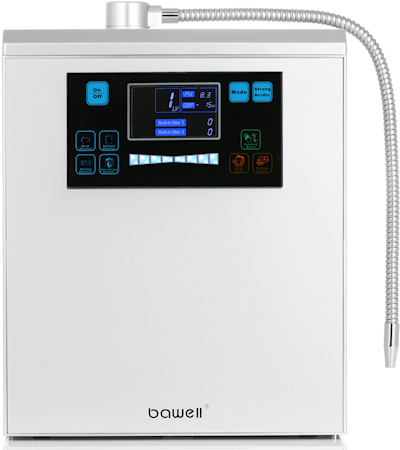 Take a good look through the information presented on the many pages of our website and especially on our benefits page to discover for yourself how a Bawell system can provide health improvement for you and your whole family! Don't wait to get started, there are economic benefits too! 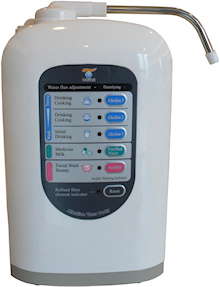 When you put an alkaline water ionizer machine system in your kitchen, you no longer have to buy bottled water. You will save money and the environment in the long run, and you will eliminate all that heavy lifting! Making your own alkalized ion rich water at home will allow you to drink the highest concentration of antioxidants in every glass. You will get the most benefit by drinking the water fresh from the machine or within 24 hours time before it can lose its ORP and other beneficial properties. Just like our many previous happy Bawell customers, you too can start benefiting from using our products today!